We are proceeding with the addition of an entire new army to the miniatures line for Flintloque and for Slaughterloo. Following on to the Von Rotte Line Infantry and the Von Rotte Command Set we have the brand new Artillery Crew released today. Read on for more information. CLICK HERE to visit the Von Rotte page on our website. This is a set of 28mm white metal and resin miniatures full of characterful touches that form a small unit to man your field guns in battle. Meant for use with the Von Rotte Legion but equally at home with any other Finklestein Dwarf army. 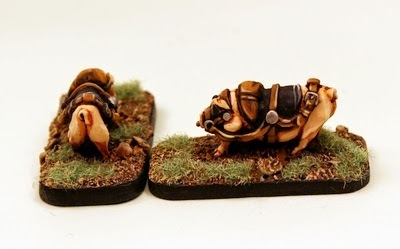 Six Dwarf gunners on foot along with two Pummilig limber pigs. A Gun Captain with his arm in a sling, foot atop a cannon ball and aiming a pistol. A sponger with sponge topped ram rod ready to clean out the cannon for reloading. A gunner with a trail spike to align the cannon before firing. 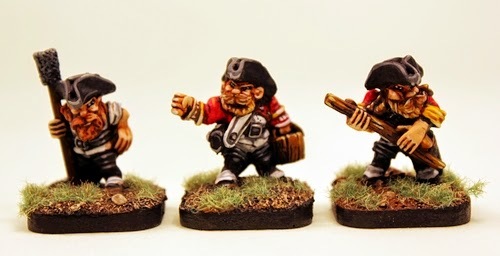 With a length of lit slow fuse out stretched a Dwarf gunner who has his Tricorne under his arm. A gunner with water bucket and arm raised in defiance of the enemy and finally a Dwarf gunner struggling with a large shotte or shelle for the artillery piece. Two identical limber pigs are included and these are Pummilig Pigs of the same kind that are ridden but with the addition of limber harness and tack. This totals eight miniatures which is the full gun crew and that will work with all of our artillery pieces but its really meant for the 59520 Mortar which is the normal Legion artillery. This set has a place in a Dwarf players collection as he builds towards a full division. Go HERE. Choose from the full set or select one single gunner on foot or a limber pig to boost your forces. All miniatures can be purchased unpainted and are supplied with bases or pro-painted with sculpted basing effect. Use the drop down options menu on the product page of your choice for details. The Baron’s hated of gunners was well known in the League Army and he refused to have them near him when on the battlefield. In fact officers who wished for promotion avoided the artillery as if their lives depended on it; the chances of advancement were very slim indeed. Few field guns operated with the Von Rotte regiments and aside from a good siege gun park, as the Baron loved reducing enemy fortresses by fire, only the mortar crews were well supported. Some Dwarven technics have argued that the desire for mortars shown by the Baron had more to do with being able to shell the enemy without having to adjust his perfect lines of soldiers on the battlefield; rather than tactical genius. Either way mortars, like howitzers are masters of indirect bombardment and have a very fine range. 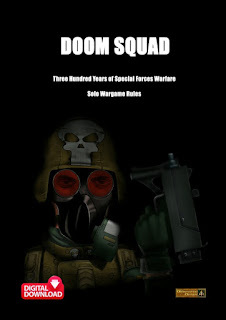 While Dwarven howizters on wheeled carriages came in six or ten pounder weight of shotte, the mortars used by the Von Rotte corps begin at ten pounds for company mortars and progress to a common twenty four pounder and some very heavy fifty pounder mortars. These brass guns sit upon wooden plinths loaded into to carts for transport and then placed on solid ground for firing. Many enemy forces are caught off guard by these mortar’s flinging shelle into their midst. Gunner crews wear white breeches and red coats with black tricorne hats. The ammunition cassions and mortar carts were pulled by limber pigs of the same breed used by the cavalry. The natural place for the Von Rotte is central Urop fighting against the Dogmen of Ostaria and the Dwarves of Krautia. 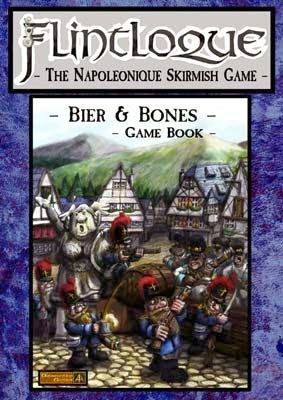 You can learn more about this campaign in 5028 Flintloque 3rd Edition Beir & Bones game book. Click HERE to visit the website to read more on this book. There are other codes in the Von Rotte range already including the Baron himself on Bristle the pig as well as Line Infantry and Grenadiers.